The Magpie's Nest...: Why Mayor Jenny The Moaning Mullet Hill is not only proud to be an adopted Queenslander, but also very, very lucky to be one. 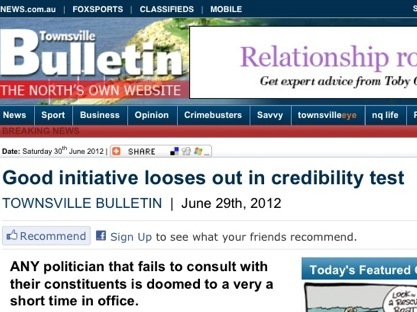 And in the week that News Ltd sacked its Townsville sub-editors, hilarious poetic justice strikes the paper. Why Mayor Jenny The Moaning Mullet Hill is not only proud to be an adopted Queenslander, but also very, very lucky to be one. And in the week that News Ltd sacked its Townsville sub-editors, hilarious poetic justice strikes the paper. Oh, indeedy, The Astonisher’s editor accidently pricks his own pomposity with one of the best own goals of the year.. But it’s not just The Astonisher having adventures in language - sources as diverse as Clive James and an unnamed ABC reporter have been having their merry way with words , too. Last Tuesday, North Queensland Newspapers sacked almost all of their Townsville Bulletin sub-editors; those who stay on after the end of August have been rebadged to do ‘higher duties’ but without extra pay or title. As has been raised in this column before, the jobs only disappear out of the Townsville community and economy – the paper will be sub-edited in Brisbane, as predicted in last Saturdays Magpie - indeed predicted and vehemently denied 18 months ago. Michael The Ogre of Ogden Street Wilkins returns to Sydney climes, his position here made redundant. He has apparently rehabilitated himself from his unnamed executive misdemeanor which saw his cheery, laughing presence here in the first place. But boy, if ever the time came when they needed subs who are not so massively overworked that mistakes were inevitable, it is now. But editor Lachlan ‘Harry Potter’ Heywood need not apply. If his effort with the headline for his editorial on Friday is anything to go by, he wouldn’t pass sub-editing 101. Mistakes in newspapers make the average journo’s toes curl up in embarrassment, but when the error is in a headline, there’s more shaking of heads than there is in the gents at half time in a Crocs game. And if the average journo’s toes curl up, when the error is the editor’s own work, he may well just curl up in the fetal position, sucking his thumb and hoping the world will go away. This from the editor. Now just to help out those folks reading this down at The Astonisher, the problem is with the word ‘looser’. A common error among the great unwashed and cranky old blogging bastards, but three things make this occasion shamefully notable. First of all, it is all editor’s own work. Although it is a sub editor’s job to write headlines, more often than not those who honk on in editorials also think up what they incorrectly fancy as snappy headers. And of course, it was a headline, which makes it stick out like Dolly Parton’s prominent parts on a cold day. But the thing that The ‘Pie particularly noted - as did those who rang him when they spotted the blooper - is the scolding, hectoring nature of it. The Steggles Googy on Face Award is all yours, ed. If indeed, Harry, you had committed this to the school paper at Hogwarts, Dumbledore would’ve sent you to the Whipping Tree and had you eating porcupine licorice for a whole term. Loose Language Loses Credibility (and readers). But if the subs have gone - and very soon, there will be only half a dozen reporters left in what will essentially be a bureau editorially – it is interesting to note that one person has retained her position. 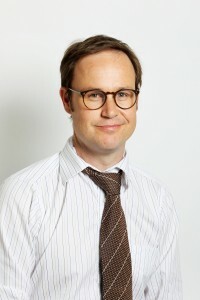 Jenny Hill remains an associate editor, judging by the Astonisher’s special brand of drivel during the week. 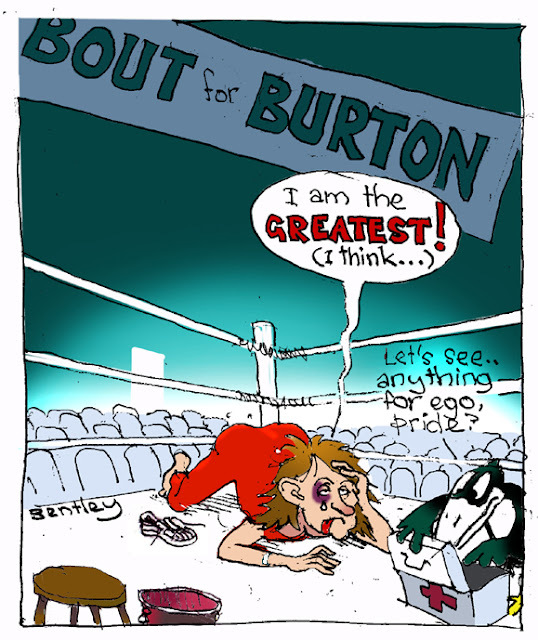 Mayor Mullet was well and truly smacked down on Tuesday, when she tried to whiteant the CEO Ray Burton, not a bloke to take on the mantle of victim. After some very pointed and insulting comments insinuating that Mr Burton had deliberately mislead the council on the matter of the deficit – and a pompous but pointless verbal fingerwag from The Mullet’s loyal brown-noser Les Messagebank Walker – the mayor moved that the CEO position be put up for grabs after Mr Burton’s performance had been evaluated. The latest episode in Mayor Mullet's Unreality Show. Talk about leading with your chin – Mayor Mullet was spanked, the motion tanking eight votes to three. She would later bemoan her fate, whingeing that she was disappointed that ‘the opposition’ had voted in a bloc. Listen, Mullet me old dear, you can’t have it both ways – if, as you insist, they are ‘opposition’, how else do you expect them to vote? You’d know all about that from those heady Mooney years, wouldn’t you? But if this group of indepedents voted as they saw fit individually, get over yourself and get on with things. Then, flexing her editorial muscle with The Astonisher a day or so later, she praised Cairns Council for having the ‘courage’ to sack their CEO, clearly suggesting that those who didn’t agree with her spiteful brand of bullying were cowards. The relevance of this opinion is unfathomable except to confirm that Lachlan Heywood feels about her in much the same way that Harry Potter feels about Hermione. Just while we’re in the neck of the woods, after Tuesday’s vote, an idle thought popped up - whether the reverse was possible – could the council raise a vote of no confidence in the mayor herself? The Magpie hears that that was fleetingly canvassed around Walker Street. The answer is no but apparently only in Queensland. Such a move is quite correctly not allowed here because the mayor is elected by the voters. In other states, mayors are selected by those elected to council, who choose one from among their number, and the mayor can be ‘demoted’ back to councillor through a no confidence motion, thus avoiding any costly rerun. So how lucky is Jenny, a transplanted Victorian, that she’s a mayor in Queensland. Otherwise, she would never gained the position in the first place. And another bit of info for nervous nellies out there. 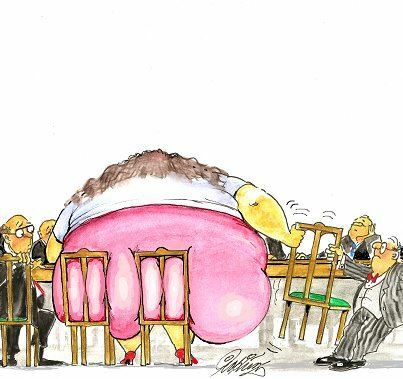 A council can only be sacked and an administrator installed if the council cannot reach decisions on issues, or is a financial disaster. The Act makes no mention of a mayor and his/her situation. So an administrator is unlikely in Townsville, because the council can make decisions, and is on a very sound financial road – thanks to the likes of Ray Burton. So Mayor Mullet’s foot-stamping and narcissistic blather denying the reality of her position is all for naught. So once again, Mullet, heed the people; get over it and get on with it. Fat chance, opines The ‘Pie. Speaking of fat chance, here’s Pickering’s succinct reason why Gina Rinehart is insisting on her own three seats on the Fairfax board. A couple of other notes on language during the week. The ailing but still very-much-with-us Clive James, pissed off that people had just about had him carked already, suggested he would be around for a while longer, so he’d appreciate if people would ‘stop getting the hearse before the horse’. Neat. And the Mangled Metaphor of the Week goes to the Victorian ABC reporter talking about the new anti-corruption commission losing some of its powers, concluding that the government wanted to ‘muzzle the Commission and remove its teeth’. Geez, isn’t dentistry tricky enough already? And a friend t’other day, discussing a mutual mate, said ‘he’s not always consistent’. Huh? Think about it. Finally, if you think things are a bit out of hand in Australia with property prices, try this from the UK: a beach hut, barely six square metres, was snapped up immediately when it came on the market, selling for more than $A250,000. No running water, virtually no other amenities hooked up to municipal grids, rates of nearly $4000 a year – and you can only stay overnight in the summer months! Bargain, eh? Read about it here. Loose gals will still have the box the cherries came in. Geez, Harry, it really is magic that you're an editor. Surely Hogwarts had better standards than that. The bias of this newspaper towards the ALP is becoming an absolute joke. A totally offensive one. Even Tony Red Ragit has shed all restraints. Child journalists will never get promoted to sub editors in the town of Townsville. FYI, most of the Astonisher's videos are contributed or made by the astonisher's graphic design department and not by media types like they used to. They seem to think that producing political media punch up games constitutes news. "Any politician (singular) that fails to consult with (Americanism, like "meet with") their (plural) constituents is (singular) doomed to a very a (extraneous a) short time in office..." Good grief! What a pity editors who fail to give their own 'loose' prose a second glance before publishing are left sitting in the Bully bunker. What's wrong with "Politicians who fail to consult their constituents are doomed to a very short time in office"? It still isn't true, but at least it makes sense. A couple of bully media shooters were really good at producing videos. They had a pro cameraman in their stables and he worked at a tv station. He was blocked by Hun to head up this department and Hun favoured the graphic designer's media techniques instead. One new video a month? Do any of your X bully editorial staff recall how the rosters would go down to three days? Our manager would not go any futher ensuring that we had no life outside of work. Ya gotta love Bentley. Knockout ! Larry Pickering is so unkind. Still laughed out loud though. Anyone remember a year or so back when sub-editors were told no one was leaving, it was cheaper for News Ltd to keep them here? This leaves the remaining subs, up to and including Simon Price, not knowing whether they’re staying or going. The word to those who expect to be ejected is: find out from the MEAA exactly what you’re entitled to. At least one editorial staff member had to call in the union to get what she was owed, and they’re certainly not above trying that again.